Cheshire East Council has given a £31,000 boost to Congleton Museum . The money is aimed at part funding the project to redevelop Bradshaw House into a new home for the museum. In the last few years Congleton Museum’s remit has expanded past the town limits to encompass exciting discoveries such as a 17th century gold ring from Middlewich, and a piece of Viking metalwork from Church Lawton. By moving to Bradshaw House the museum will be able to offer greater facilities and become a heritage hub for East Cheshire . 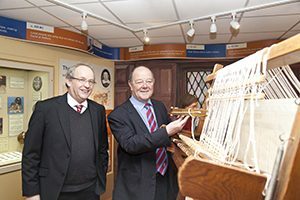 The grant cheque was presented to the museum by Councillor David Brown, Deputy Leader of Cheshire East Council, during a visit to the current premises. The museum is a tremendous community asset and this boost will help the Bradshaw House project move forwards. 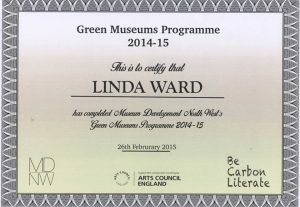 The museum is proud to announce that after completing all three modules of the Greener Museums programme, our volunteer Linda Ward graduated last Thursday and received this lovely certificate.